3.2 Which factors affect motivation? 3.3 How do you raise motivation? The case explains that the context is an adult educational centre, not necessarily a higher education institution. Nevertheless, it explicitly provides instruction to adults. Subjects involved are primarily students and facilitator, but if expanding the scope of influence of the course strategy, it can reflect on the institution itself if the success is manifest and the relevance of the activities proposed are projected towards the community where it is located. Eventually the participants can organize contests, challenges, games, or any other type of similar programs. The most relevant subjects can be categorized as recipients: The facilitator also gets inspiration and expertise from the experience with each group. The learners can be subdivided in groups to analyze their needs, and interests and further be able to make the SWOT analysis: Students can be advanced/experienced or beginners/novices; two are the scopes of capacity differentiated: on the subject matter: photography, and on technological aspects to transform the pictures and process them: software mainly. When targeting an optimal learning scenario for advanced students only, novice participants cannot compete because they cannot match the demands of the course activities. As a result their incompetence will demotivate this group and disassociate it from the rest. This can lead to drop outs, unsatisfactory engagement, lack of collaboration, etc. When targeting an optimal learning scenario for the novice students only, advanced students will be unproductive, demotivated, uninterested and disconnect, protest, and request more attention, and the delivery of the expected advantages, they would also form separate groups and disassociate from the rest, unlikely to recommend this course to any other person, to the detriment of the centre in general. 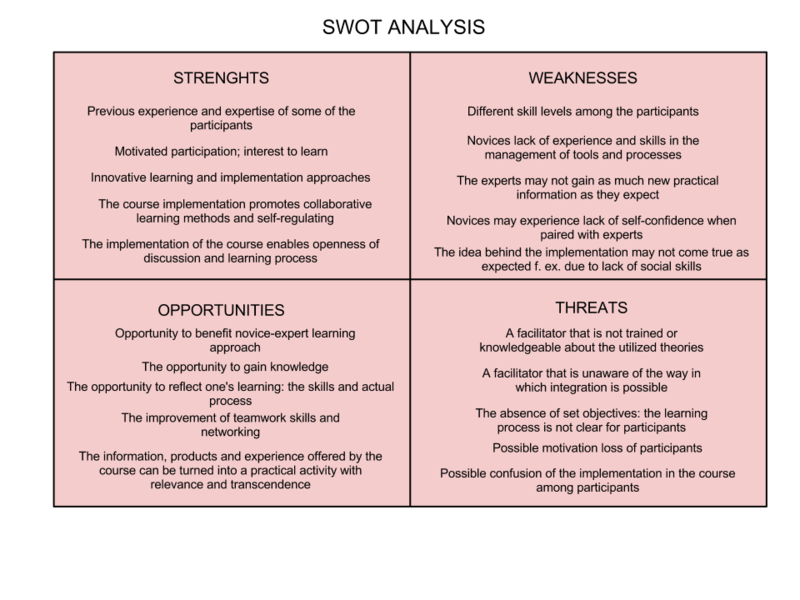 The following SWOT analysis illustrates the most important assessing factors that can affect the design and formulation of a curricular activity that affords each party an optimal participation and gain.